I like to make a tea cake for my in-laws when we go over for a Sunday lunch, and this time I made Fresh Ginger Cake (recipe printed in the Toronto Star, originally from Classic Home Desserts by Richard Sax). The perfect treat after a meal since ginger is a great digestive. In large bowl, sift together flour, cinnamon, cloves and pepper (if you like extra ginger action, add 1/2 to 1 tsp ground ginger at this point). In another large bowl, mix molasses, sugar, eggs and oil with electric mixer at medium-high speed until well blended, about 2 minutes. Add flour mixture; mix at low speed just until blended. In small cup, stir baking soda into water; quickly add to batter along with minced ginger. Mix just until blended. Combine icing sugar and lemon juice until a smooth paste is formed. 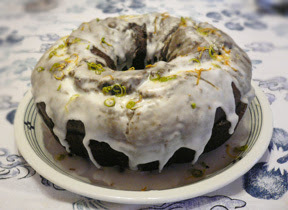 Stir in zest (pictured here using both lemon and lime zest) and drizzle over cake. *NOTE: It's important to mince the ginger, since grating it produces undesirable fibres. This cake contains almost exclusively Vata-friendly ingredients and is not recommended for Pittas or Kaphas. However, to make Pitta-friendly, reduce ginger to 2 Tbsp; and for Kaphas, use millet flour, replace molasses and sugar with date puree or fruit juice concentrate, and reduce oil to 1/4 cup while increasing applesauce to 1 cup. This sounds so refreshing. I can't wait to give it a try. Happy New Year! Wonderful, whole, healthy dessert recipes. You are making my mouth water. My only complaint about this recipe is that it's too good! I was forced to make a second one because my roommates ate most of the first the day before the party I was going to bring this too. 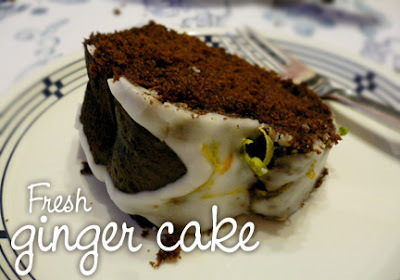 Excellent recipe, not too sweet, moist and wonderful! Didn't even try the sugar frosting yet, the cake is good enough on it's own. That's so great, thanks! Glad everyone is loving this cake. I love how dark and moist it is, with the sweetness balancing the sharpness of the ginger. Yum. Oh this sounds awesome. I'm a big fan of ginger.And, speaking as a single woman, I think men who can cook are the best! nice moist tasty cake, I used agave syrup instead of sugar, and mostly wholewheat / attar flour, as prefer to avoid too much white flour. No icing was required. I forgot to say that my cake cooked in about 35 minutes, so best to check cake around this time; in case it burns.